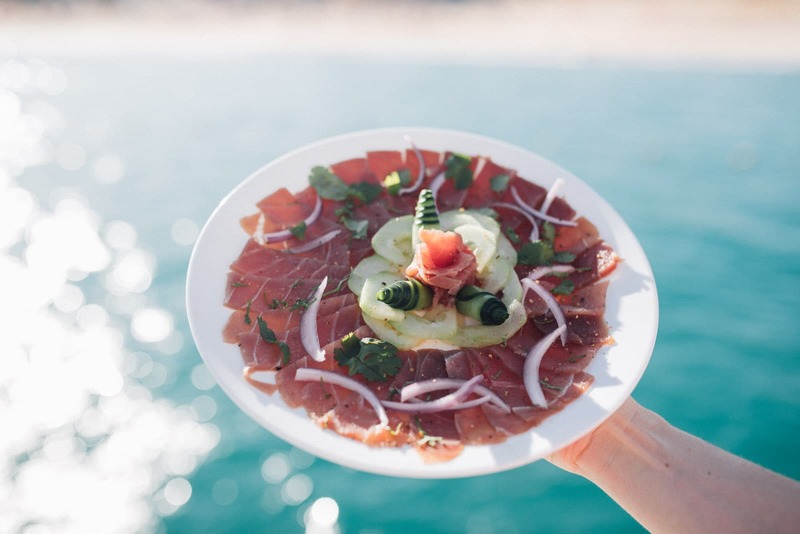 Cabo Yacht Charter Menu: Your Private Chef. Your Private Yacht. 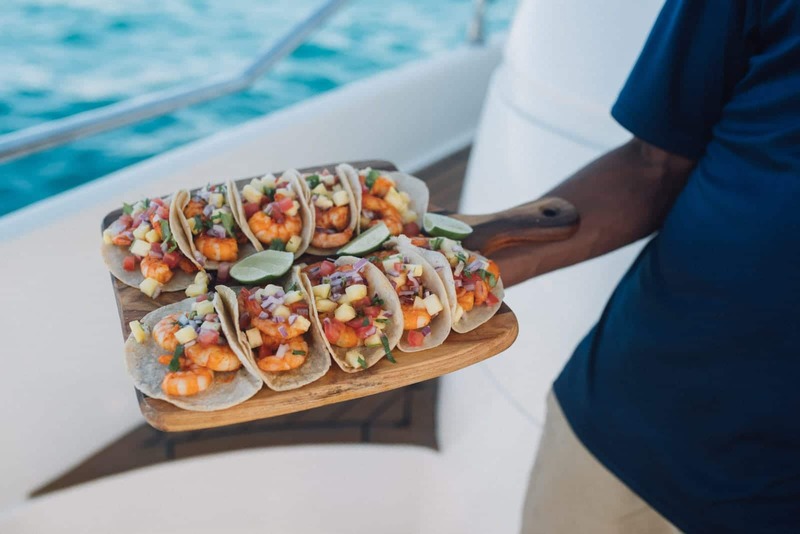 Restaurant quality menu, everything prepared fresh aboard the yacht. Your Menu. Your Private Chef. All charters come with a fruit platter as well as chips and freshly diced Mexican style salsa, Pico de Gallo. 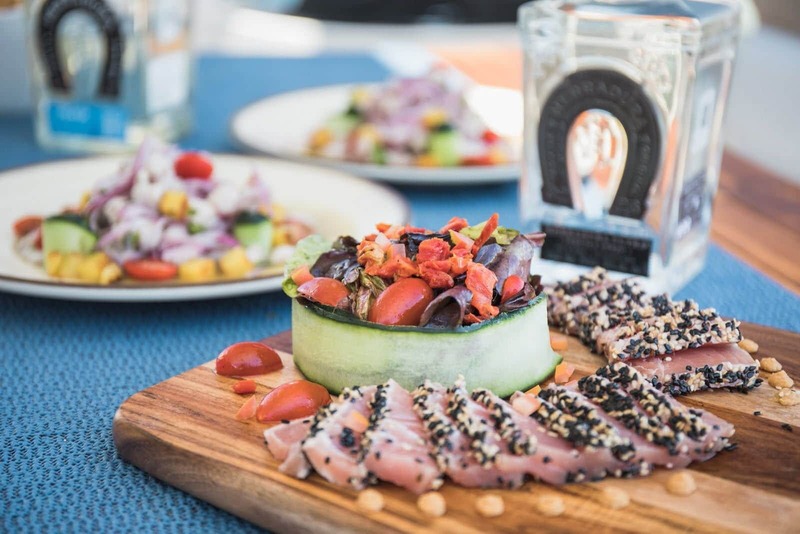 Our menu is served tapas style, so instead of one full sized sit-down meal, it will be served as it’s ready throughout the charter. 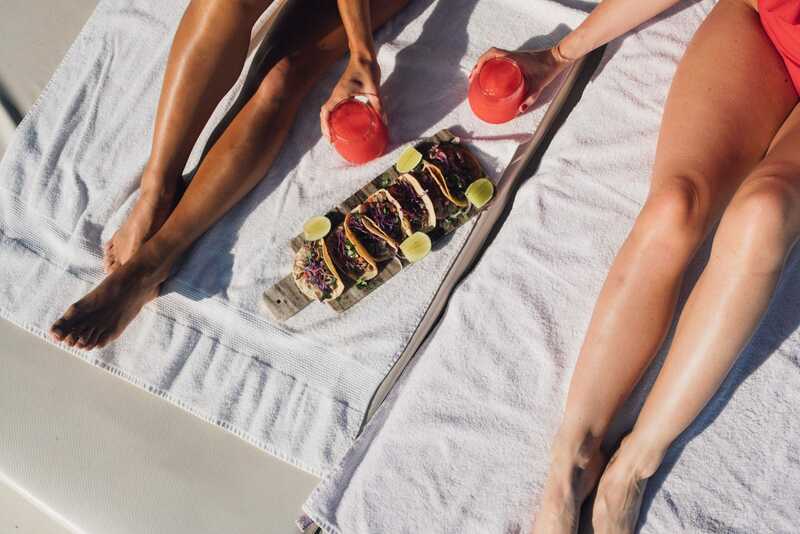 We’ve found this the best way to eat aboard a yacht. Everyone can pick and choose at their leisure, relaxed and dine wherever on the boat they’d like. 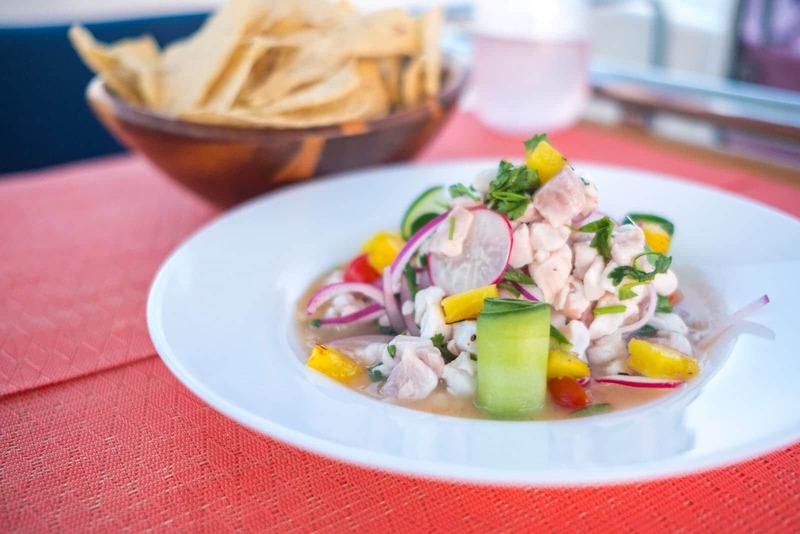 Many of the items are based off of the fresh seafood that is plentiful in Los Cabos and a bright, colourful style that reflects the vibrance of Cabo San Lucas. Of course there are also red meat, chicken, vegetarian and vegan options that we personally love! 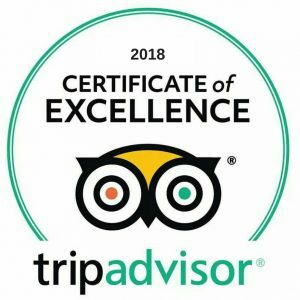 Kids aboard? Add one selection from the kids menu below. Up to ages 12. Dry guajillo peppers, garlic, white onions, butter, lime juice with salt and pepper. All our fish is fresh caught, so this may be substituted for another seasonal white fish like snapper or mackerel. Portion: 1 piece of dorado per guest on a bed of rice. Fresh caught tuna, seared with salt and pepper, topped with a miso glaze. Simple and fresh. Fresh shrimp, cooked in lime juice with cilantro, diced tomatoes and white onion. 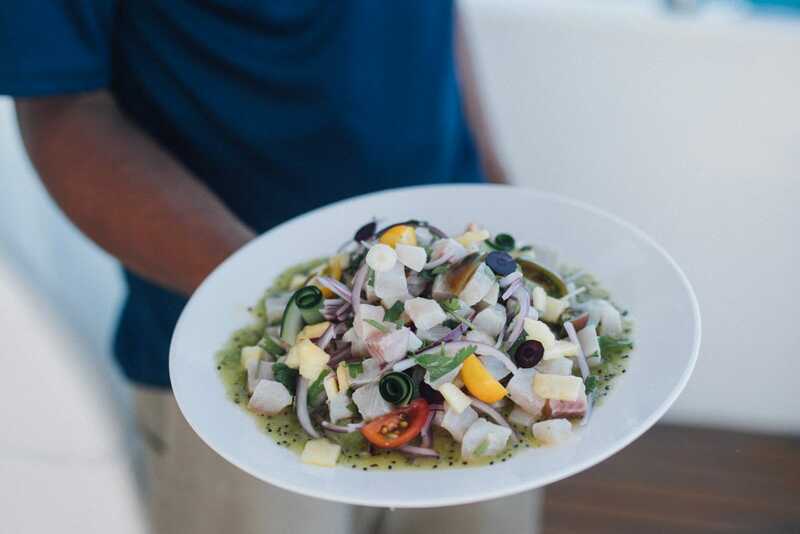 Fresh white fish (grouper, dorado or snapper) cooked in lime with red onion, cherry tomatoes, radish, salt, pepper and topped with cilantro. Fresh tuna, finely sliced in a house marinade with red onions, cucumber and avocado. Portion: Approximately 6 slices of sashimi per guest. Marinated butcher’s steak on flour tortillas with a fresh made garlic and avocado sauce, red onions, cilantro and red cabbage. Pineapple, bella mushrooms, smoked paprika potatoes, tomato, cilantro and white onion in corn tortillas. Marinated and seasoned chicken or steak with a fajita medley of veggies, served family style with tortillas and sauces. Portion: One chicken breast or equivalent size in steak per guest. A simple classic. Cheese or chicken with cheese quesadillas made aboard with a trio of sauces including sour cream, salsa verde and salsa roja. These are always a favourite. Portion: 6 pieces per guest. In addition to your main tapas selections, add one item from below for kids up to age 12 to share. Breaded and fried chicken fingers served with fries and ketchup. Portion: 4 chicken fingers per child and a side of fries. Portion: 1 sandwich per child, cut into triangles.